Source: Charles Dingley, ed., The Devotional Harmonist (New York: George Lane and Levi Scott, 1851), p. 373. See Notes and Links to Translations of "Stille Nacht"
1. Silent night! halllow'd night! 2. Silent night! hallow'd night! Jesus, the Saviour has come. 3. Silent night! hallow'd night! Sing to heaven in anthems of praise. Heaven and earth in full chorus of praise. Sheet music from Charles Dingley, ed., The Devotional Harmonist (New York: George Lane and Levi Scott, 1851), p. 373. Sheet music from R M Bishop, ed., The Christian Hymnal: A Collection of Hymns and Tunes for Congregational and Social Worship. Revised Edition (Central Book Concern, 1882), p. 197, #557. 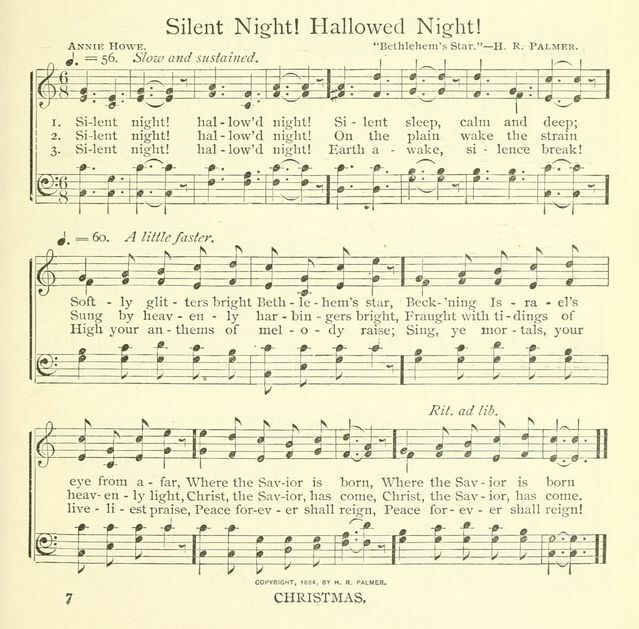 Sheet music "Hallowed Night" by Asa Hull from Asa Hull, ed., Happy Greetings (New York: Asa Hull, 1888), p. 150. Sheet music from Edwin Barfield Chappell, William James Kirkpatrick, eds., Songs of Praise and Service (Nashville, TN: Smith & Lamar, 1912), p. 149, No. 152. 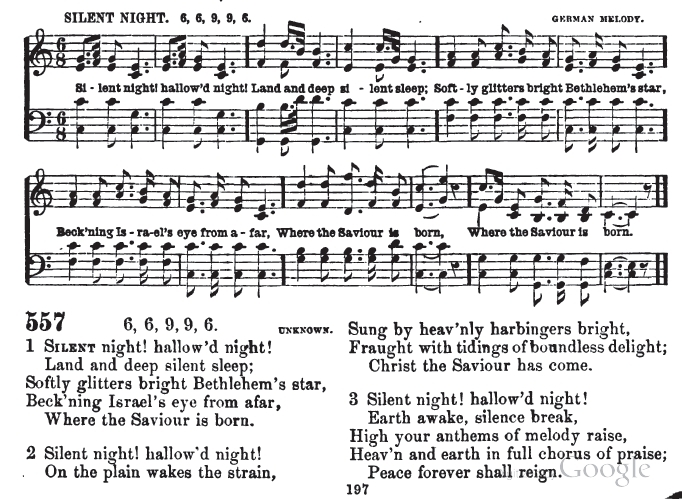 Sheet Music "Bethlehem's Star" by H. R. Palmer from Life-Time Hymns (Chicago: R.R. McCabe & Co., 1896), p. 83. This is believed to be the oldest translation of "Stille Nacht" in the English language. Translated by J. F. Warner, it was first published in Charles Dingley, ed., The Devotional Harmonist (New York: George Lane and Levi Scott, 1851), p. 373. Prepared for some Methodist Episcopal Churches in New York and New Jersey, the copyright was 1849. The scanned copy found at Google Books was damaged. The correct lyrics were kindly supplied by Mr. David Macfarlane, to whom I am very grateful. According to John Julian, this carol was also found as No. 131 in Campbell's 1865 Christian Hymn Book (text only). Julian also wrote that "it is suggested by, rather than a tr. of the German." 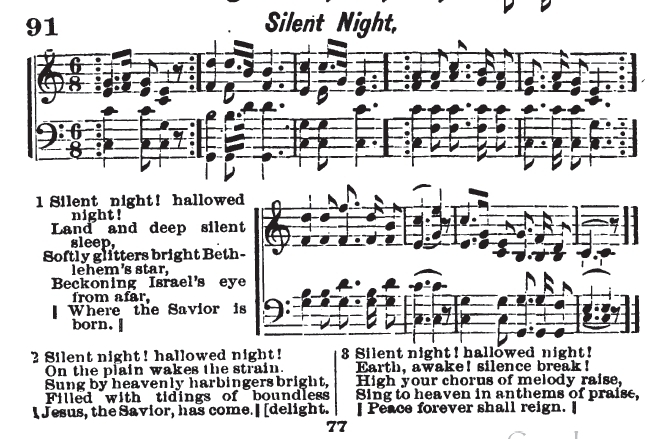 (Dictionary of Hymnology, 1907, p. 761). This observation is also true of most other "translations" of Stille Nacht. It should be noted that the Campbell version contained an altered fourth line in the third verse, a not uncommon occurrance. N. H. Aitch, ed., The Golden Book of Favorite Songs. Tenth Edition (Chicago: Hall & McCreary Company, 1915), p. 114. Alexander Campbell, ed., The Christian Hymn Book: A Compilation of Psalms, Hymns, and Spiritual Songs, Original and Selected, Third Edition, Revised (American Christian Missionary Society, Bosworth, 1866), p. 81, #131. Also in the 1870 and 1876 editions. A. I. Hobbs, et al., The Christian Hymnal Revised (Christian Publishing Co., 1882). 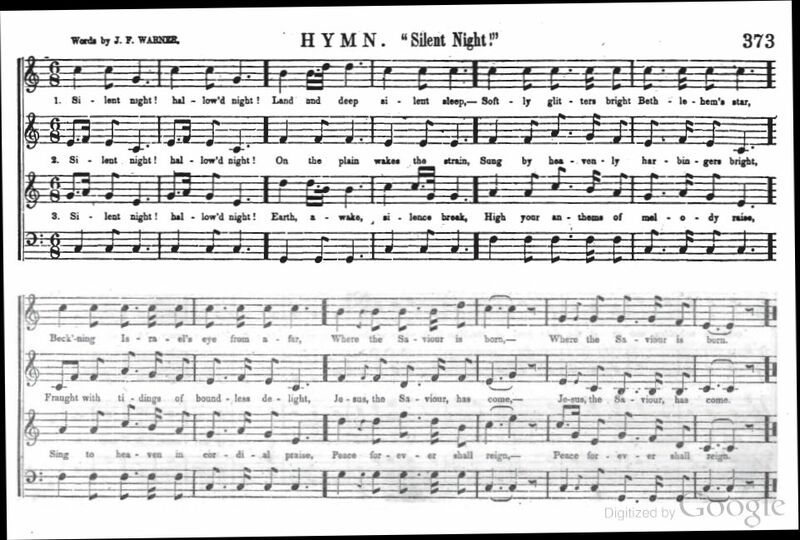 The Hymnary identifies 38 instances of Warner's "translation," including adaptations.